If you are looking for information on the New Feet Store franchise business opportunity, New Feet Store franchises or New Feet Store franchising, then you have come to the right place. The New Feet Store specializes in arch supports, comfort shoes and related footwear. The corporate owned store in Seal Beach, California has been in business as a foot comfort center - in the same location - since 1997. Our company has helped thousands of people who suffer from foot-related concerns, including ankle, knee, and lower back pain, poor posture and balance. You've dreamed about running your own business, but the details can be overwhelming. The New Feet Store franchise offers you the brand, training and support to own and operate your own retail business! The New Feet Store franchise opportunity provides you a distinctive offering in a niche industry supplying world class personally fitted arch supports, comfort shoes, specialty footwear and other unique products. If you are ready to join a select group of individuals who are committed to uphold the New Feet Store brand with pride and confidence, and a dedication to serving our customers, we would like to hear from you! Our mission is to help you achieve your financial goals, while bringing comfort and relief to people of all ages and lifestyles. Team your skills with our expertise and support to achieve your long term objectives. 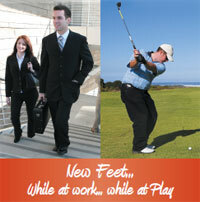 If that appeals to you, then the New Feet Store franchise may be just the opportunity you have been looking for! We combine the highest quality products with superior customer service. In today's disposable retail environment it's hard to find superior merchandise, combined with individualized attention and sincere customer care. However, with the New Feet Store, you can bring world class foot comfort products and service offerings to customers in need - right in your own neighborhood. No previous orthotics experience is needed! What we look for is customer focus, natural business and management skills, a willingness to learn and work hard, and your passion for helping people in need.